Have you ever experienced that frustration – when your hair stays dry and brittle even after using so much of conditioner during the wash? Well, because it’s not the right way and the chemicals can damage it further. 1. Your scalp isn’t able to provide enough moisture: Actually, our hair strands cannot produce oils on their own so they depend on the hair roots. When the scalp fails to retain enough moisture to hydrate the hair roots, it leads to dry hair. 2. Hair Shaft Unable to Hold the Moisture: Each strand of hair is shielded by a protective layer called the cuticle, which holds in moisture and keeps the hair hydrated under normal conditions. When this cuticle is stripped off due to environmental factors, the moisture from the hair escapes leaving it dry. Whatever the reason might be, dry hair can be treated by providing extra care, moisture and hydration. This can be achieved by a simple ingredient like Avocado. Is Avocado Efficient in Treating Dry and Frizzy Hair? The monosaturated fatty acids and natural oils in avocado form a protective layer over the hair strands and seal the open cuticles to prevent further moisture loss. The high vitamin A content in avocado helps to ensure adequate sebum production, which prevents hair from drying out. Avocado also contains iron, vitamin E & B7 which naturally repairs dry and damaged hair. Avocado is an excellent source of amino acids. They work as potent antioxidants to shield dry hair from further damage and prevent hair breakage. The amino acids, potassium and magnesium present in avocado work towards ensuring optimal blood flow to the scalp, keeping it hydrated, nourished and healthy. 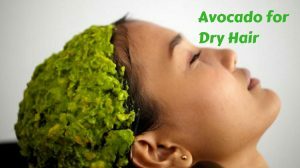 How to Use Avocado for Dry Hair? The simplest method of using avocado for dry hair is to directly apply its pulp or oil on the hair and scalp. It can also be used in combination with other natural ingredients as hair masks to hydrate dry and damaged hair. Use a ripe, medium-sized avocado. While applying the hair masks, make sure you focus more on the tips of your hair as these tend to be the driest and most damaged parts. Follow up the shampooing with a mild conditioner in case of excessive dryness. Avocado acts as an effective natural conditioner for dry hair. Direct application of avocado pulp as a nourishing mask on hair and scalp works to rejuvenate and moisturize the dry hair. Cut open a ripe avocado into two halves. Scoop out the pulp and mash it using a fork or a masher. Dampen your hair with cool water. Smear the mashed pulp all over your hair and scalp. Put on a shower cap so that it doesn’t drip. Wash off with water; shampoo and condition as usual. Repeat this every alternate day for a fortnight. Avocado oil is the simplest and most effective natural remedy to nourish and moisturize dry, damaged and brittle hair. Take a small quantity of avocado oil in a bowl. Apply it to your scalp and hair. Massage gently in circular motions for 3-5 minutes. Tie you hair in a loose ponytail or clip it up and leave it on overnight. Wash off with a mild shampoo in the morning. Repeat the application on alternate days for a month. A simple way to combat dryness of hair is by making your own homemade avocado shampoo. This can be used instead of the usual shampoos containing harsh chemicals which damage the hair. Chop 1 avocado and blend it into a fine paste. Add ¼ cup warm distilled water and blend until it attains a uniform consistency. Add 4 teaspoons baking soda to the blended mixture and mix well. Use this paste as a shampoo on damp hair. Massage it on hair and scalp gently for 1-2 minutes. Use it twice a week to cleanse your hair. Note: This homemade avocado shampoo is non-foaming, so it will not work up a rich lather like other chemical shampoos. However, it will be very effective in cleansing and moisturizing dry hair. Milk is a rich source of vitamins and minerals that works as an excellent natural conditioner and nourish the hair follicles. Take pulp from 1 avocado in a bowl. Add 2 tablespoons of full-fat milk to it. Apply this mixture to damp hair and scalp. Re-apply thrice a week for a month. Note: You can also add 1 tablespoon of olive oil to the mixture for better results. Coconut oil forms a protective layer around the hair shafts to prevent moisture loss and control the frizz. It also helps to prevent the hair breakage. In a bowl, mash 1 avocado till it is free of lumps. Once your hair is fully covered with it, wear a shower cap. Rinse off the mixture with cool water followed by a mild shampoo. Repeat procedure twice in a week. The citric acid in lemon juice helps to maintain the pH levels of the scalp and seals the cuticles to prevent moisture loss from the hair shafts. Combine pulp of 1 avocado and 2 tablespoons of lemon juice. Apply it on damp or dry hair and scalp. Wash it off with cool water and a mild shampoo. Re-apply twice a week for a month. Mayonnaise is rich in oils that deeply condition dry hair, giving soft, smooth and lustrous locks. In a bowl, mix pulp of ½ avocado and 1 cup of mayonnaise. Apply the mixture on scalp and hair thoroughly. Cover with a shower cap and leave it on for 20 minutes. Wash off the mixture; shampoo and condition as usual. Use this hair mask twice a week. Lecithin is a protein component of the egg yolk which helps reduce dry and frizzy hair. Fatty acids present in the egg yolk helps to improve the dryness of the scalp. Blend the pulp of 1 avocado with 1 egg yolk till it attains a smooth texture. Apply the paste liberally on damp hair from the roots to the tips. Wrap hair in a bun and cover with a shower cap. Wash off the mixture and shampoo hair thoroughly with cold water. Apply this hair mask once in a week. Note: You can also add 1 tablespoon of lemon juice to the mixture. Lemon juice helps to remove the pungent odor of the egg yolk. Banana is rich in natural oils, potassium, carbohydrates and vitamins which help soften the hair and prevent dryness. Blend 1 ripe banana, 1 ripe avocado and 1 tablespoon of olive oil together. Apply it evenly to damp hair and scalp. Massage it in with circular motions. Wear a shower cap and leave on for 15-20 minutes. Wash off the application; shampoo and condition as usual. Apply once a week for shiny and lustrous hair. Nutrient-rich almond oil has high amounts of vitamins, monosaturated fatty acids and polyunsaturated fatty acids which help to keep the hair nourished and hydrated. In a blender, add pulp of 1 avocado, 2 cups of coconut milk and 3 tablespoons of almond oil. Blend until it turns into a smooth paste. Apply the mask liberally to hair and scalp. Leave the hair mask on for 20-30 minutes. Rinse with water; follow up with shampoo and conditioner. Apply twice a month for best visible results. Honey is a natural humectant that helps to seal moisture within the hair shaft. This prevents stripping of excessive oils that lead to dryness of hair. Blend 1 chopped avocado, 2 tablespoons honey and 2 tablespoons olive oil. Apply on hair and scalp with your fingers. Wear a shower cap. Blow dry at low heat on the shower cap for about 15 minutes. Or else you can also sit out in the sun for 30-45 minutes. Note: You can also add 2-3 drops of lavender essential oil to the ingredients in the blender. Tea tree oil is a natural remedy for treating all kinds of scalp problems, from dryness to flakes. Argan oil is an effective natural hair conditioner, rich in beneficial nutrients like fatty acids and Vitamin E which help to combat dryness. In a bowl, mash 1 avocado into a pulpy paste. Add 10 drops argan oil, 2 tablespoons honey and 1-3 drops of tea tree oil. Stir until the mixture attains a smooth and creamy texture. Using gloves, apply the mixture directly on to scalp and hair. Massage gently for 1-2 minutes and leave on for 15-20 mins. Rinse thoroughly, shampoo and condition as usual. Yogurt has excellent hydrating properties that work in combination with avocado to repair and condition dry and damaged hair. Jojoba oil is packed with Vitamin E, B-complex, copper, selenium, chromium, zinc and iodine which are all essential for healthy hair growth. Add the pulp of 1 avocado, 1 tablespoon yogurt and 1 tablespoon jojoba oil together in a blender. Blend until the mixture attains a smooth consistency. Apply evenly on damp hair and scalp. Let it stay on for an hour. Rinse off with water; shampoo and condition. Shea butter seals in the moisture by coating each strand of hair in a thin, non-greasy layer of fat. It is a great natural emollient and moisturizer for the scalp and hair. Apple cider vinegar is a natural gentle cleanser and conditioner that maintain the pH level of the scalp, preventing dryness of hair. Into a blender, add 1 chopped avocado, ½ cup shea butter, 2 tablespoons apple cider vinegar and ¼ cup olive oil. Blend until a smooth paste is formed. Wait for 30 minutes and rinse well with cool water. Re-apply every week for soft, shiny locks. Olive oil is an excellent natural conditioner for dry and frizzy hair. Its hydrating properties help in restoring the natural moisture content of the hair shafts. In a bowl, mash avocado pulp with a fork till it is no longer lumpy. Add 1 tablespoon of olive oil into it. Dampen your hair with water. Apply the mixture evenly on hair and scalp. Wear a shower cap over it and leave it on for an hour. Re-apply alternate days a week for best results. Oatmeal is an effective natural moisturizer for dry hair. The combination of oatmeal and avocado as a hair mask can help in treating a dry and itchy scalp. Blend pulp of 1 ripe avocado, ½ cup oatmeal and ¾ cup milk. Add 2 tablespoons olive oil to the paste and mix well. Apply this paste all over your hair and scalp. Mix pulp of 1 avocado, 1 cup yogurt, 2 tablespoons olive oil and 1 tablespoon honey. Note: You can also just add 2 tablespoons of yogurt to mashed avocado in a bowl and apply it as a nourishing hair mask for dryness. Vitamin E works as a natural antioxidant that helps to repair the dry and damaged hair follicles, encouraging healthy and nourished hair growth. Add 1 chopped avocado, 1 mashed banana, 1 tablespoon yogurt and 2 tablespoons olive oil to a blender. Squeeze out the oil from 2-3 Vitamin E capsules into the mixture. Apply it on your hair and scalp. Rinse off with water followed by a mild shampoo. Apply at least once in a week. Aloe vera contains beneficial proteolytic enzymes that work to repair the dry and damaged hair. This combination is perfect for treating dry and frizzy hair. In a blender, add 1 chopped avocado, 2 tablespoons honey, 2 tablespoons aloe vera gel, 1 ½ tablespoons lemon juice and 2 teaspoons coconut oil. Blend till it attains a smooth consistency. Apply on hair and scalp and cover with a shower cap. Repeat the method once in 2 weeks. This is a natural deep conditioning hair mask which contains some of the most potent natural ingredients to prevent dryness of hair. Mix 1 cup of avocado pulp, 1 ½ tablespoons honey, 1 tablespoon each of coconut oil and jojoba oil, 3 tablespoons apple cider vinegar and 1 egg. Blend all ingredients together until they form a smooth paste. Dampen the hair with warm water. Apply this deep conditioning avocado mixture all over your hair and scalp. Massage gently and leave it on for 25-30 minutes. Rinse the hair mask thoroughly with water; shampoo and condition. Repeat the process twice in a month. It is always recommended to carry out a simple patch test on the skin with avocado paste/oil to make sure you aren’t allergic to it. Make sure the avocado pulp is lump-free and smooth in consistency before applying it on the hair. If the avocado bits are difficult to wash off once the application dries up, use a wide-toothed comb to remove the bits patiently. Applying hair masks to damp hair makes the mixture spread more evenly on the hair strands and the scalp. For best results, wash off the hair masks with cool water instead of warm or hot water, which strips off the moisture in hair, leaving it dry and lifeless. If you have dry hair but an oily scalp, avoid direct application of avocado on hair roots. Start from 1-2 inches above the hair roots and apply till the tips of the hair strands. If your hair is thin or limp, avoid using the deep conditioning hair masks, because they tend to weigh the hair down. Letting the hair air-dry after any natural avocado hair mask treatment is recommended. Using hair dryers can lead to further damaged, dry and frizzy hair. If you are in a hurry, switch off the warm option on the hair dryer and then dry your hair keeping the dryer at a distance of at least 15 centimeters away. Avocado can stain clothes. Always use an old t-shirt and a shower cap to prevent straining. Always choose a mild shampoo that is sulfate-free or surfactant-free. They might not produce too much of a lather, but are gentle cleansers of the hair and scalp. Instead of a rough towel, use a soft cotton cloth to squeeze out the excess water. Vigorous rubbing leads to damaged hair and split ends. Say goodbye to dry, damaged and rough hair with any one of these natural combinations of avocado hair masks that suit you. Which one of these avocado hair masks turned out to be the most effective? Are there any other natural remedies you use for dry hair? Do share your thoughts, experiences and suggestions in the comments below. Can i mix yogurt avocado and yogurt all 3 ingredients together? ?